A flicker ignites the end of a cigarette. A deep inhalation precedes a release of smoke into the Tennessee sky. Less than three weeks later, this very gesture will launch 40 people into the wilds of Frozen Head State Park as it begins to emerge from a long winter’s nap. On this early March evening, it serves solely as reflective pause before Gary “Lazarus” Cantrell’s answer to the question of whether the participants of this year’s running of the famed Barkley Marathons, the race he’s directed since its inception 30 years ago, really understand the journey on which they will embark. For a select group of ultrarunners, December brings not only holiday cheer, but also notices of Barkley race entry acceptance. Their belated gift of more than 100 miles, over 60,000 feet of vertical gain, an unmarked course and inhospitable terrain won’t be theirs to unwrap until April. Barkley is still a few months away, and Jared is discussing his experience with the race from his home in Salt Lake City. One of only 14 finishers, and only the second of those 14 to successfully complete all 5 laps under the cutoff on more than one occasion, he is a revered veteran of the race, the very “kind of people” that Laz claims makes the race so special. Almost better described as a modern day explorer than pigeon-holed as an ultrarunner, Jared has established a multitude of mixed-discipline routes in his home state of Utah, has finished the Hardrock 100 Endurance Run 10 times and won it outright in 2010, is one of few to have completed Colorado’s infamous Nolan’s 14 line within its allotted 60-hour cutoff and has competed in some of the most renowned ultra races across the world. Not that you’ll hear Jared say much about any of those accomplishments, as his seeking spirit is likely already planning the next adventure rather than revisiting those past. Pacific Northwest-based Heather Anderson is returning to the Barkley for her third attempt. Last year she was one of only a handful of participants to head out on a third loop, and her confidence can only be bolstered by having since completed the fastest ever self-supported thru-hike of the Appalachian Trail, a distinction that she already held for the Pacific Crest Trail. She’s learned that she’ll have the opportunity to do just that come April. “As a woman, I can say that we aren’t as fast as men, and that’s ok, but I still think it’s about time we had a woman finisher,” says Jennilyn, conceding her own personal interest in taking a shot at putting the “no woman has ever finished Barkley” stigma to rest. With more than 16 years of racing experience, accomplished ultrarunner ,but first-time Barker, Ty Draney is also hoping to learn from the veterans. “Maybe I can birddog early and learn some of the course, so that even if I get scraped by the vets I can figure it out,” he says. 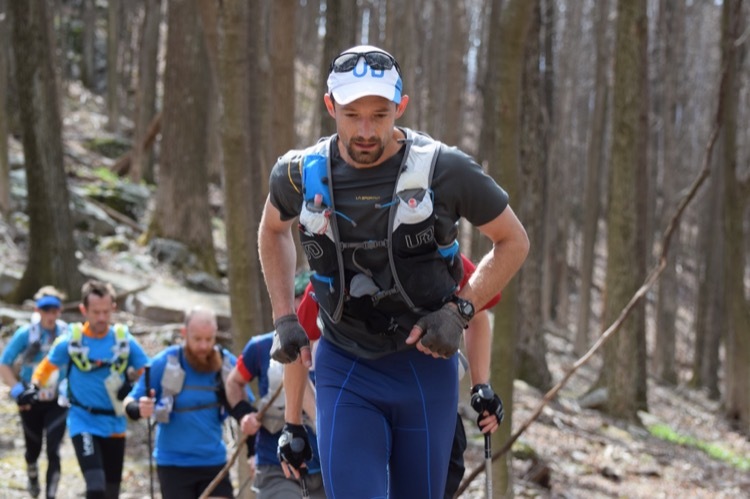 Several years prior, while in Virginia to run the Mountain Masochist, Gary found himself in the presence of two Barkley finishers, Andrew Thompson and Jonathan “JB” Basham, as well as Travis Wildeboer, who had not yet finished Barkley, but would in 2013. The animated conversation about Barkley that ensued simultaneously sparked an interest and convinced Gary that he wasn’t yet ready to give it a go. The HURT 100 course record holder and the man who recently set the FKT for the Wonderland Trail that encircles Mt. Rainier, Gary certainly possesses a considerable amount of talent and willpower, but neither will matter if he remains stuck on the Weight List. Though not designed specifically as a Barkley training run, the Running Up For Air (RUFA) 24-Hour Grandeur Peak Challenge, put on by Jared to raise money for efforts to improve air quality along the Wasatch Front, provides an excellent systems check for Jared, Jennilyn and Ty. Held on February 27th and 28th, RUFA tests participants to see how many times they can climb to the top of Utah’s Grandeur Peak and return to the trailhead over the course of a single day. Each lap measures roughly 10k and serves up 2,500 feet of gain. RUFA’s final tally shows Ty amassing 7 laps for a total of 40.6 miles and 17,920 vertical feet. Of the 50 or so other participants, Jennilyn’s totals of 11 laps, 63.8 miles and 28,160 feet of gain are elapsed only by Jared’s 13 laps, 75.4 miles and 33,280 feet of gain. He hasn’t been idly awaiting that news, consistently cranking out 30,000–40,000 vertical feet-weeks of training soon after recovering from a second place finish at his beloved HURT 100 in mid-January. Meanwhile, on the other side of the globe, Heather is bagging peaks herself, continuing her training while trekking in New Zealand. The sun rises on April, and the mischievous initial day of the month finds the Big Cove Campground at Frozen Head State Park a flurry of activity as runners arrive. They hand Lazarus their non-refundable $1.60 entry fees and the customary license plates they’ve brought from home in exchange for their Loop 1 bibs. They anxiously transfer details from Laz’s official course map to maps of their own and mull over final pre-race preparations. Those preparations include decisions on when to turn in for the night, as many runners speculate that after last year’s 11:23 a.m. start, the conch blown to signal that the race is about to begin may very well sound closer to midnight than to midday tomorrow. Nervous energy abounds as darkness settles in. Hours later, morning breaks without interruption, and Lazarus mills indifferently about camp, leisurely walking his dog, Little, and giving no indication as to when the race will start. Mercifully, the sound of the conch finally fills the air at 9:42. While confirmation that the race really is going to happen provides momentary relief, it almost immediately gives way to a spike of new anxiety over the fact that the race not only really is going to happen, but will do so in just one hour. Writers and photographers, many of whom have come to Frozen Head clued in to the race only recently by The Barkley Marathons: The Race That Eats Its Young, a documentary that began streaming on Netflix earlier in the year, scuttle about in search of story-and-camera angles. Laz endures the cameras as the gentleman it might surprise many to learn that he is, but changes nothing about the way he whiles away the last hour before the race ensues. At the stroke of 10:42, after a reverential roll call of those past Barkers no longer living and a moment of reflection in their honor, another lit cigarette releases runners to the “very private and personal experience” that Barkley and its race director have promised them. True to that promise, much of what manifests over the next 60 hours does so out in the steep drainages of the Cumberland Mountains, behind the ridgetops, amongst briars and undergrowth, away from the sight of anyone but the Barkers themselves. As the runners seek out the 13 hidden books that contain the pages that need to return with them to camp to prove they have successfully navigated the course, storylines, like anxieties the day before, abound. Rhonda Avery, legally blind, accepts the Barkley challenge. With the constant company of guide Christian Griffith, she collects pages from four books, and spends 30 hours on course before hitching a ride back to the fabled yellow gate in camp for the trumpeted taps that signals the end of a Barker’s race. Blind runner Rhonda-Marie Avery following Christian Griffith on the Cumberland Trail early in the race. Starchy Grant, Kimberly Durst and Brad Compton blur the lines between futility and triumph, each collecting 13 pages and completing a loop, but taking 31 hours, 59 minutes and 9 seconds to do so. Of the 40 starters, 25 venture out for a second loop and are reduced to just seven by the time the third loop begins. There are three successful “Fun Run” finishers (three loops), all of whom also complete a fourth loop. The third of these three is John Kelly, the local son, who staggers down off of Bird Mountain toward camp, reaching the gate with 13 minutes and 2 seconds left before the cutoff to attempt the final lap. While he is physically present, it isn’t evident if his mind and spirit are fully in his possession. John departs the gate to a choir of clapping, whistles and cheers that aren’t enough to sustain him any farther than 100 yards before he bends down in the warm late morning sun and falls fast asleep. A short time later, with the concerned and slightly stunned onlookers in camp as witnesses, he rises again to his feet, turns to face the trail ahead, and summons the resolve to slowly ascend Bird Mountain in pursuit of the first book. He comes back again hours later after collecting just one additional page, but with his place in Barkley lore firmly established. John’s return leaves only two runners out on loop five, each headed in different directions. This year, Heather runs her own race from the beginning, navigating almost flawlessly on the first loop, an accomplishment noted by several virgins who benefit from her presence as they labor to find their way around the course. She and Heather end up moving in tandem for much of loop one and two, until Heather takes ill.
Jennilyn takes that urging to heart, navigating the rest of loop two on her own and completing the lap under the cutoff. A flurry of helping hands serves as pit crew to get her fed, dressed and back out of camp to begin a third loop with a broad grin on her face. Minutes before her departure, Heather marches into camp with stoic acknowledgement that she is returning without all of the necessary pages for an official two-loop finish. She receives a sincere “Thank you” from Jennilyn and warm words from Laz before an emotional tap out. Teamed with Jason Poole, another seasoned Barkley veteran and a world-class orienteer, Ty leaves on his third loop less than an hour before Jennilyn. The two have spent much of the preceding day and night together. As Ty and Jason collect their pages at the top of the infamous Rat Jaw powerline climb, about a third of the way through the third loop, they are still on pace but have not made up any ground on the indifferent clock as the sun begins its dip from the sky for the second time since the conch was blown. Barkley veteran Dale Holdaway arrives just behind them, rounding out a capable trio that will need to be spot-on navigationally the rest of the way in order to register an official three-loop finish. Day has very nearly turned to night when Jennilyn reaches the top of Rat Jaw. While she still has enough in her tank to continue, the solo nighttime navigation looms that much more daunting, and she decides to end her race. She’s gone farther than any other woman has this year, farther than all but six other participants. In the very early hours of Monday morning, after time has come and gone for a recognized three-loop finish, three headlamps approach the gate. Ty, Jason and Dale are in possession of all 13 pages, despite knowing for the last several hours that they’ll only be given credit for the first two loops. The two remaining runners on loop five, headed in different directions, are Jared and Gary. Stride for stride, they spent nearly every minute of their 47 hours on the first four loops together. Only having spoken once before coming to Barkley, they have forged a fast and undoubtedly lasting friendship in the Tennessee wilderness. Having relied on Jared’s knowledge of the course through the first few loops, Gary had pressed him for his preferred direction for a fifth loop and insisted that regardless of their order coming into and leaving camp after loop four, Jared would have his choice of going clockwise or counter-clockwise. Jared chooses to go clockwise and as soon as that is agreed upon, the veteran begins teaching the virgin. While both athletes crave and relish the quiet, solitary moments that ultrarunning provides, they also concur that it was bittersweet to have to part ways for that final loop. The next time they meet, it is clear that only one of them still has a shot at finishing the Barkley, and it is a poignant moment for both of them. “When we eventually did cross paths and it was obvious that I was going to time out, there was a real look of dismay on Jared’s face that I wasn’t going to attain that finish,” Gary says. Having gotten turned around a bit navigationally, sleep deprivation certainly not helping matters, he has simply run out of time. Possessing those very same ingredients, Jared draws upon all of them to become this year’s only finisher and the first person to ever finish Barkley three times, touching the yellow gate with just 27 minutes and 30 seconds to spare in an elapsed time of 59:32:30. For the uninitiated or those looking outside in, all too receptive to the narrow narrative of eccentricity, a sadist race director and a cast of masochistic participants, it is a tagline readily accepted. It’s true. As long as we’re willing to keep going, there’s always opportunity to better define ourselves, opportunity to redefine success and failure. Dreams don’t have to die. Not at Barkley, not in life. But every now and then, they need to change. Change? Maybe. Die? Not likely. As long as the race endures, as long as runners like John Kelly keep getting back up, keep wanting to truly test limits of all shapes and sizes, as long as there are people who are truly willing to buy it with their soul, then Barkley will continue to be a special opportunity to better define ourselves, an opportunity to redefine success and failure.